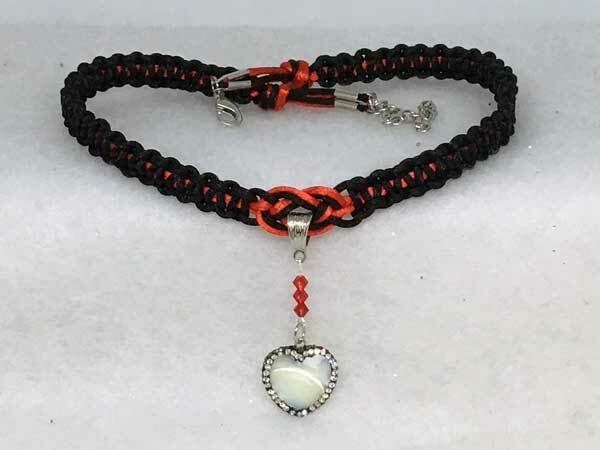 This necklace is made using nylon cord in combination with satinique cord. The length can vary from about 16.5 to 19.5 inches with a center jeweled piece that adds 2 inches. I have used black and red cord for this piece and then added in three red bicone crystals to coordinate. The main character here, though, is the heart-shaped shell pendant. It is GORGEOUS! The picture just does not do this justice. As all shells do, this heart pendant has lots of beautiful, natural striations on both sides that pick up the light with movement. As if that was not enough, it is surrounded in rhinestones on both sides, making the piece reversible. Oftentimes, a pendant has a right side...not this one, which is nice, since the cord also has no right or wrong side. Even the sides of this heart have sparkle, with black rhinestones all along the edge.